Silicosis is a fibrosing disease of the lung caused by inhalation, retention, and pulmonary reaction to crystalline silica, exposure to which occurs as an occupational hazard in quarrying, mining, masonry, and sand blasting. Systemic sclerosis (SS) has been defined as a generalized disorder of small arteries, microvessels, and diffuse connective tissue, and is characterized by scarring and vascular obliteration in the skin, gastrointestinal tract, lung, heart, and kidney. Its etiology is not fully understood, though many occupational exposures are implicated such as vinyl chloride, epoxy benzene, organic solvent, and less commonly, silica exposure. Compared to other connective tissue disorders, silica-associated systemic sclerosis (SA-SS) is relatively rare. To our knowledge, three cases have been reported in India till now. A 42-year-old male presented with progressive dyspnea on exertion since 6 month, swelling of legs since 4 month, cough with minimal expectoration and fever since 1 month. The patient also complained of tightening of the skin of hands, feet, face, back, and chest for the last 4 months. There was also associated generalized joint pain and bluish discoloration of fingers on exposure to cold. There was no history of dysphagia, hemoptysis, chest pain, loss of appetite, and loss of weight. Patient had not taken any antitubercular treatment previously. He had no history of hypertension and diabetes mellitus. He was a nonalcoholic and nonsmoker. He worked as a stone cutter in the mining industry for the past 15 years. On general physical examination, there was limitation of opening of mouth (microcheily). Cutaneous examination revealed extensive thickening of skin over the face, dorsum of hands, forearm, chest, back, and legs [Figure 1]. Skin over the chest and back was shiny and tight and there was loss of wrinkles on forehead. There were pitted scar at finger tips on both hands [Figure 2]. Joints of the hand, wrist, and knee were tender. Digital clubbing was present. No abnormal findings were detected on respiratory system examination. Complete blood count, liver function test, and renal function test were normal. HIV was nonreactive, and the patient was euglycemic. There was no hematuria and albuminuria. Serum C reactive protein (CRP) and rheumatoid factor was negative. Sputum Ziehl-neelsen stain was negative. Skiagram chest PA view showed q (1.5-3mm) nodules over middle and lower lung zones bilaterally [Figure 3]. Two-dimensional echo revealed no evidence of pulmonary hypertension. Upper gastrointestinal endoscopy was normal. Fibreoptic bronchoscopy revealed normal tracheobronchial tree. No Mycobacteria grew on bactec culture performed on bronchoalveolar lavage. Spirometry showed restrictive pattern (FVC-37% with normal FEV1%). 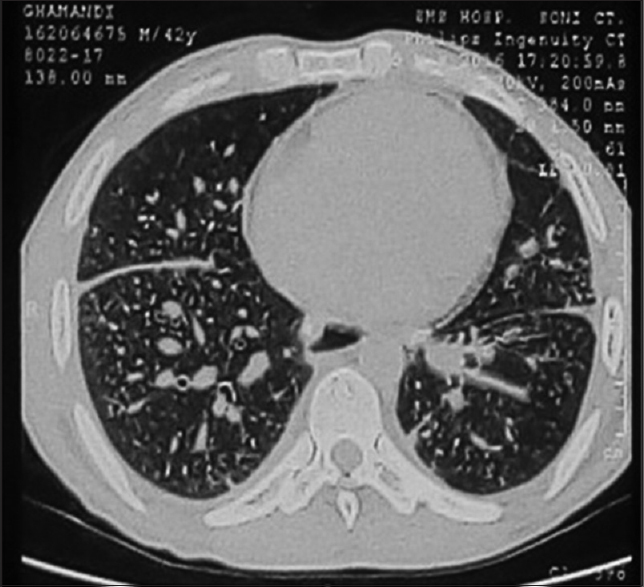 High-resolution computed tomography of the chest showed randomly distributed nodules in both lungs [Figure 4]. Antinuclear antibody (ANA) was found to be positive. Scl-70 antibody titre specific for systemic sclerosis were 123.03 units (>80 strong positive). 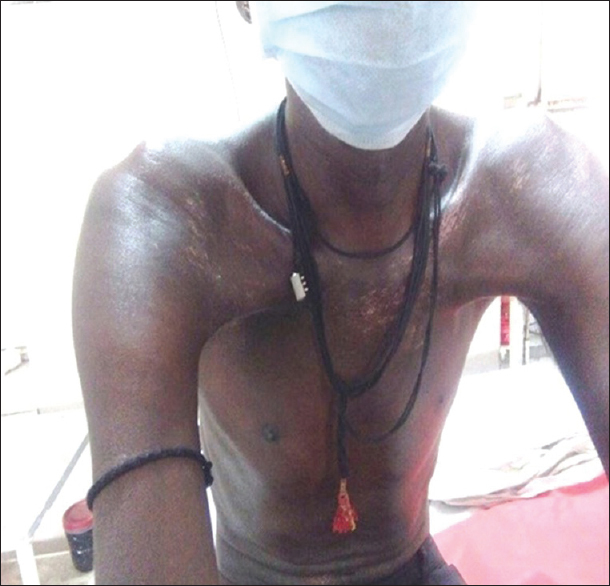 On detailed clinical, radiological, and immunological evaluation together with prolonged history of stone cutting, the case was diagnosed as simple chronic silicosis with SS. Few case reports have documented the co-existence of silicosis and progressive systemic sclerosis (PSS). In 1914, Bramwel first reported an association between scleroderma and occupations associated with silica exposure. In 1957, Erasmus described an apparently high prevalence of PSS in gold miners exposed to dust containing a high percentage (±30%) of free silica compared with a large male nonmining hospital population. Rodnan et al. also noted that, of the 60 male patients diagnosed to be suffering from PSS in the period of 1955–1956, 26 were exposed to prolonged and heavy exposure to silica dust. Chronic exposure to silica causes alterations in soluble interleukin-2 (IL-2) receptors in affected patients. Increased lymphokines either stimulate collagen production or other cells such as monocyte or mast cells to release factors that in turn induce collagen biosynthesis in fibroblasts. This is supported by the fact that increased levels of soluble IL-2 receptors are found in systemic sclerosis. Silica can activate monocyte to release cytokine IL-1, 6, and TNF alpha which are fibroblast proliferative factor, which increases the production of collagen leading to cutaneous sclerosis, vascular occlusion, and pulmonary fibrosis. SS has also been seen in cases of short intense exposure (5–10 years), i.e., patients with accelerated silicosis are more prone to autoimmune disease. SS is characterized by three major processes – disease-specific autoantibodies, organ fibrosis, and small vessel vasculopathy. There is a female preponderance in 30–50 years age group. Patients can be classified into two principal subsets defined largely by the pattern of skin involvement as well as clinical and laboratory manifestations. Diffuse cutaneous SSc is associated with progressive skin induration, starting in the fingers and ascending from the distal to proximal extremities, the face, and the trunk. These patients are at a risk of early pulmonary fibrosis and acute renal involvement. Patients with limited cutaneous form of systemic sclerosis (lcSSc) generally have long-standing Raynaud's phenomenon before other manifestations of SSc appear. Skin involvement in lcSSc is slowly progressive and remains limited to the fingers (sclerodactyly), distal extremities and face, but the trunk is not affected. Other affected organs include lung, gastrointestinal tract, kidney, musculoskeletal system, and heart. No drug significantly influences the natural course of SSc overall, but various drugs are of value in treating organ-specific symptoms. Penicillamine is used for treating skin thickening for a long time. Calcium channel blockers, such as nifedipine 20 mg po tid or as an extended-release formulation, may help Raynaud phenomenon but may worsen gastric reflux. Bosentan, sildenafil, tadalafil, and vardenafil are other alternatives for severe Raynaud phenomenon. Diot E, Lesire V, Guilmot JL, Metzger MD, Pilore R, Rogier S, et al. Systemic sclerosis and occupational risk factors; A case control study. Occup Environ Med 2002;59:545-9. Bramwell B. Diffuse scleroderma: Its frequency; its occurrence in stonemasons. Edinburgh Med J 1914;12:387-401. Erasmus LD. Scleroderma in Gold-Miners on the Witwatersrand with Particular Reference to Pulmonary Manifestations. S Afr J Lab Clin Med 1957;3:209-31. Rodnan GP, Benedek TG, Medsger TA Jr, Cammarata RJ. The association of progressive systemic sclerosis (scleroderma) with coal miners' pneumoconiosis and other forms of silicosis. Ann Intern Med 1967;66:323-34. Devulder B, Plouvier B, Martin JC, Lenoir L. The association: Scleroderma-silicosis or Erasmus' syndrome (author's transl). Nouv Presse Med 1977;6:2877-9. Khanna N, D'Souza P, Sud A, Pandhi RK. Systemic sclerosis in a stone cutter. Indian J Dermatol Venereol Leprol 1997;63:111-3. 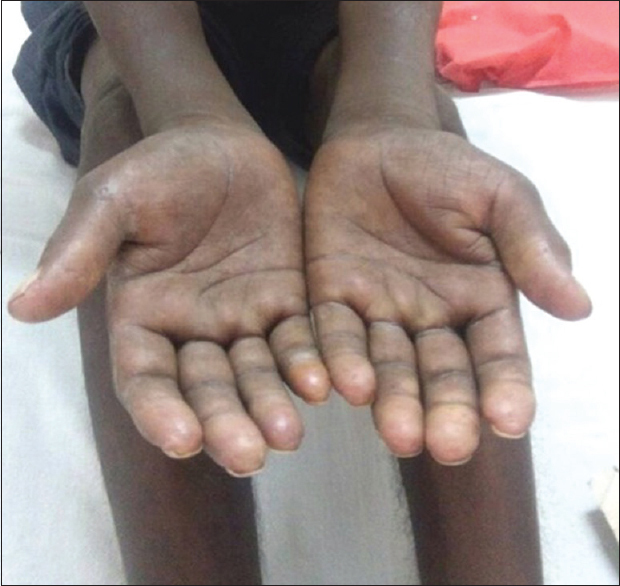 Bainara M, Arya M. Silica associated systemic sclerosis-an uncommon case report. Int J Res Med 2013;2:199-202. 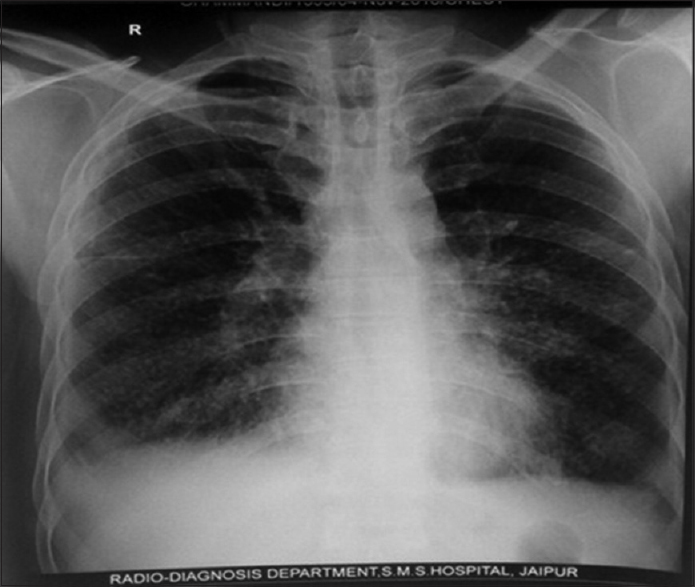 Ganguly J, Kumar A, Samanta SK, Mitra R, Kundu S. Erasmus syndrome: A case report of silicosis induce scleroderma in a 26-year-old male. Oman Med J 2013;28. Diaz SY, Moran M, Unamuno P, Armiyo M. Silica and Trichloroethylene induced Progressive Systemic Sclerosis. Dermatology 1992;184:98-102. Varga J. Systemic sclerosis (scleroderma) and related disorders. In: Anthony's fauci, Eugene Braunwald et al., editors. Harrison's principles of internal medicine. 17th edition. New York: McGraw hills; 2008.p2096-106.